In this episode of Inbound Sales Journey, Ryan and Gray discuss how to make your agency stand out in a competitive sales situation. The marketing and website agency space is full of competition. In such a crowded marketplace, it can be hard for agencies to stand out from the competition and win contracts. In the past, you may have had a hard to attain agency credentials like a HubSpot partner, or Google Partner. This would make you stand out from the competition. However, most agencies you'll be competing against will have credentials like this. The uniqueness is no longer there for the client. In the past with GuavaBox, inbound was still new, so that was a great way to differentiate from standard SEO or PPC services. 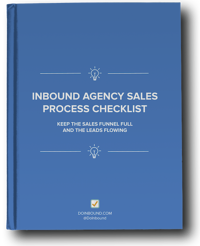 But, in this space, there are a lot of agencies bidding for inbound contracts, and the methodology is much more well known. What worked in the past may not work now, so don't live there. Since everyone does everything or tries to or says, they will focus on what you do best and that alone. It may be just a small piece of the puzzle. Be up front with prospects about what you're good and strong at and what maybe you wouldn't be as strong at on a project. This shows your level of honesty, as well as helps them decide what they need. It also shows that you do know your stuff. This will help overcome objections too beforehand since you're clear with potential shortcomings. But focus on what you do best without ignoring what you're weak at. You need to show you're not afraid to lose their business, which indicates confidence in your agency and ability. A lot of agencies will just list off what they can do or will do for a client based on what the client says they need. Being able to step in and provide the strategy, which includes saying you should or shouldn't o that helps with the client. Many prospects want to be with an agency that is confident in what they're doing and guiding the client. It shows confidence in what you do, while many agencies are afraid to turn down business. Get them on the phone with a past client you helped that had a similar need or problem you solved. This builds trust and is far more compelling than a case study. Hearing from a real customer will help them feel more at ease with working with you. Having social proof from others is more powerful than just having a client rely on your word or what you say about yourself. Take time with the sales process. Don't jump in and get the details on the whole website and map it out there right from the start. Show that you have a process and chunk it out. You want the prospect to see you think big picture. You want to start with strategy first and test them as a fit for you and your agency. You don't want to overwhelm the client or appear overeager. Desperation shows you may want the business too much because you can't hold onto a client. Neediness is toxic for your agency. The ultimate goal for a client is to mitigate and maximize ROI. Keeping this in mind and getting smart about how to do it will work wonders for your sales strategy and process. You'll be able to stand out from the competition and land your ideal clients. Side note, all these tips apply to your dating life as well, so for any single agency owners, sales reps, or marketers out there. This blog post may very well transform your love life life. And if it does, feel free to send me your thanks in the form of Bitcoin.